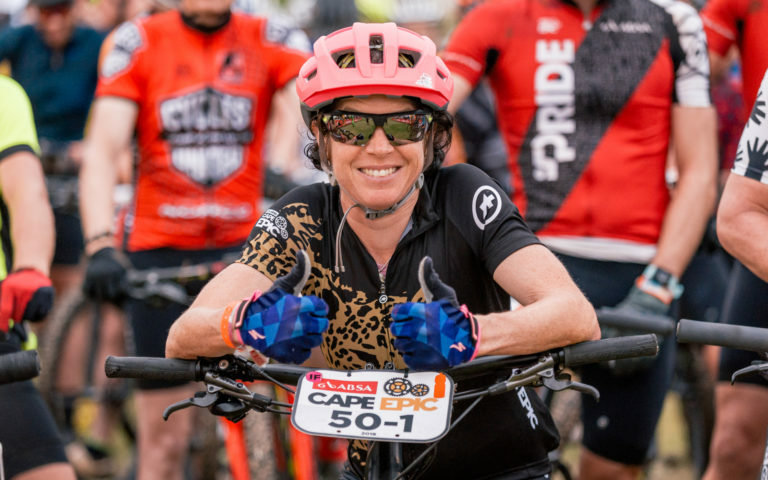 Cape Epic update stage 4 to 6…. Another long stage of over 100km and this morning I wasn’t the only #lonelyleopard, I have one of the men’s field join me !!! Block C started so fast today, actually a little too fast for me. I deliberately took some speed out as I couldn’t match the pace and on top of this, the first 60k were flat. They also included stretches of loose sand which didn’t make riding in a pack any easier!! After yesterday with very limited amounts of singletrail it was a pleasure on this stage. The singletrails were back!!! The disadvantage was the opportunities to overtake were very limited. The trail sections were quite long and the riders were strung out in a single row which looks great but its also not so fast. After the third waterppoint I took fresh bidons, oiled the chain and when I set off I was alone again ! In front I saw two riders but I soon reeled them in and passed them. From then on I was almost alone until the next feed zone. I really felt like a #lonelylepoard…. Hunting the Zebras! Shortly before the last feed station I closed in on three riders and with them, I started the ascent to Brains KLoof pass. Unfortunately one rider had annoyed me a little while getting the food and he had a little flounce and skipped a share of the leading work. I rode up front alone in the wind for a long time. One of the men from the mixed teams took pity and led occasionally which was a blessing. But each time it got steeper, I got faster and the others were dropped. I could see a few riders far ahead of me and this motivated me to push on fast to catch up. I also succeeded in doing so, I was able to overtake and passed 3 teams! The trail should actually start to descend, but the headwind was so strong that I had to kick more than freewheeling. Only after a few km’s did it actually roll unassisted. Then we had to leave the asphalt road and we went down towards Wellington on trails !! The bottom of the valley arrived, with 10km to go. I tried again to push harder, because far ahead I could see Hielke and Cony! I could not overtake her today, but I finished shortly after them! This morning I started for the time trial and for the first properly time alone ;-). My start at 8.43am … at first things went pretty quickly. However, the climb was quite long! In this climb I was able to catch and overtake many teams in front of me. It was hot and I was glad when finally the food came and I could change my bidon! Shortly before I reached the food I joined Peter (also a solo rider)! Yesterday I had an altercation with him and apparently he had not calmed down yet …. first he rode into the rear wheel, buzzing me, as I rode in front of him (I said nothing as it can easily happen ;-)) then he passed me right before the food and took my bidon from the table! Of course, I was angry and shouted that this was my bidon! The supporters also called him back, he stopped so that I could take the bidon, but that was not enough !! He actually hit my helmet with his hands !! I was really shocked and did not know what had happened to me !! I was pretty unsettled and had to collect myself first after that !! The problem now was that I would still be behind him and overtaking on the singletrack that would follow. I was genuinely worried that he might try to push me off the bike! When I was finally back with him, I asked very politely if he would let me pass. He replied curtly that he would not give up anything for me, I was already unfair from yesterday and he also had reported it to the race officials! O-kayyyyy, if that’s how it is I’ll stop behind him and then I’ll report it to the Race Officials! After another discussion, he finally let me through and I was able to continue. For me, the whole thing was finished, and now I fought against the mountain, hairpin to hairpin! It was really hard, but also really nice! Finally, I had to ride Cool Running behind a slightly slower rider, that was a pity … in the short climb to the I had overtaken a rider but had his teammate in front of me, but they rode a little faster downhill…. After this cool descent, we went about 9km to the finish, with the last 5km on the same section as the day before! Shortly after crossing the line Kati (the Race Director) came to me and wanted to know what exactly happened at the Feedzone! I told her and the Commissar. They also asked me how they should punish him. I said, if he leaves me alone tomorrow, it would be okay for me! I do not want any trouble at all but just finish my race! The climbs today were not really long, but mostly pretty steep! After 20km the first single trails arrived and with the trails also came the traffic jams! With my dropper post I really had fun in the downhill and, above all, I was pretty fast and I quickly closed on the leading rider! The ascents in the singletrack slowed me but then overtaking wasn’t an issue, because there was a long snake of riders! Even if I can’t fully accelerate, I noticed after the last day in the saddle, it is not always easy not to be able to ride your own pace. You have to adapt to the rider in front of you. Especially, riding in the pack is so demanding because of the dust, you can see almost nothing and you always have to watch what happens directly in front of you …. that requires mental strength and concentration! Also because it’s about nothing more (except to arrive tomorrow Sunday in „Val de Vie“) it is not so easy to stay focused! Whenever possible, I tried to overtake some riders between the singletrack passages, which was not always easy! Slowly I worked my way up position by position, and there were a few, because I started this morning again from Block C! In the last 10km I drove past an accident and I was reminding myself again, that it is actually not so important, whether I have a minute more or less, the main thing I get to the finish in good condition with one eye on the racing season ahead. I took some speed out on the following descent, because I had to concentrate fully on the race again and put what I have just seen aside! Finally I arrived at the finish after more than 4 hours. After a shower and a fine lunch in the „Perfect Place“ with Angi, Nicole and Morne we let the day come to an end! The Final stage separates me from my 9th Cape Epic finish !! I’m looking forward to tomorrow! !